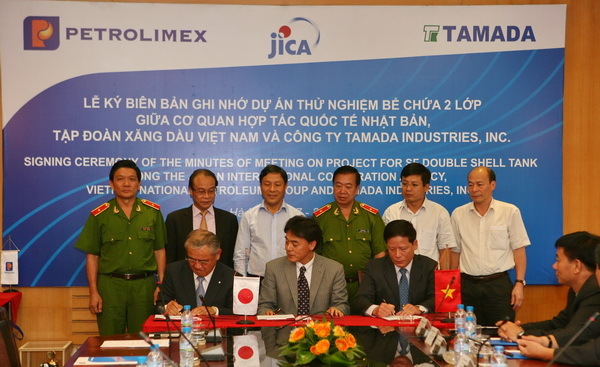 Hanoi July 27, 2013 This afternoon, Vietnam National Petroleum Group (Petrolimex), Japan International Cooperation Agency (JICA) and Tamada Industries, Inc. (Tamada) officially signed a MoU on cooperation in the trial project of double-shell tank against harmful matters. Petrolimex, Jica Vietnam and Tamada officially signed MoU on trial cooperation in double - shell tank against leakage of harmful matters. Vietnam National Petroleum Group (Petrolimex), Japan International Cooperation Agency (JICA) and Tamada Industries, Inc. (Tamada) officially signed a MoU on cooperation in the trial project of double-shell tank against harmful matters. Read more about Petrolimex, Jica Vietnam and Tamada officially signed MoU on trial cooperation in double - shell tank against leakage of harmful matters. Hanoi April 16, 2013 This afternoon at Keang Nam Landmark Tower Hanoi, Vietnam National Petroleum Group (PG), FPT Group and SAP firm held the “Review meeting of ERP deployment in PG”. PG is the first group of Vietnam that successfully applied the ERP, a solution for management of enterprise resources aiming at materializing the development strategy in the new phase, compatible to the form of a public company and the process of restructuring after equitization. Dong Van 28 November 2012. This morning Vietnam National Petroleum Group (Petrolimex) and the People’s Committee of Dong Van District held a meeting to review 3 year implementation of Resolution 30a/NQ-CP by the Government and signed an agreement of support for the year 2012-2013. Vietnam National Petroleum Group has the honour to notify that from the 12th January 2012 we officially identify the brand name and logos by new procedures on all our system, from the holding company, the Vietnam National Petroleum Group, to the member companies at home and abroad.